WASHINGTON: President Donald Trump’s embattled health secretary was forced out of the US administration Friday, amid a scandal over his use of costly private jets for government travel. “Secretary of Health and Human Services Thomas Price offered his resignation earlier today and the president accepted,” White House press secretary Sarah Huckabee Sanders said in a statement. The announcement came less than an hour after Trump told reporters that Price had not offered to resign, but that his fate would be decided later Friday. The deputy assistant secretary for health, Don Wright, will be tapped to take over for Price on an interim basis, Sanders said. For days Price has battled to keep a position he has held for less than eight months, after it emerged he had repeatedly used taxpayer funds to hire private jets. In all, Price has flown on 26 separate trips this year on private aircraft, totaling some $400,000, according to Politico. He tried to put a lid on the scandal by paying back what turned out to be a fraction of the cash spent. The trips were for government business, Price’s department said, but some of the flights were to destinations where the health chief owns property, or where he met relatives. 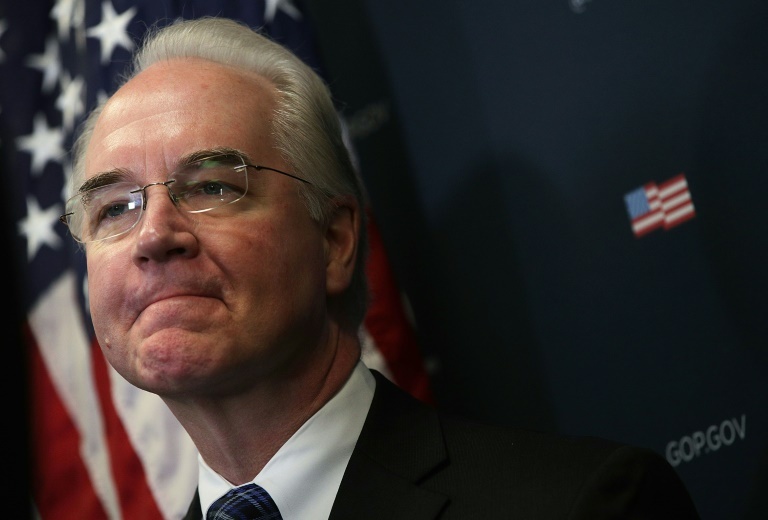 Price had also been intimately involved in Trump’s failed efforts to overturn Obama-era health care reforms. With that effort now stalled in Congress, Price’s replacement will have to decide whether to take measures to prop up the current system or let it fail. Republicans say Obama’s reforms are unworkable. Democrats and independent experts say Republican plans would see millions or tens of millions of people lose insurance. In his resignation letter Price said it was an “honor and privilege” to serve in Trump’s administration. “I have spent forty years both as a doctor and public servant putting people first,” he wrote. Trump had earlier indicated that Price’s job was hanging by a thread. Trump described the former congressman as “a very fine person,” adding that for some cabinet secretaries it was not a problem because they have their own planes. It has been revealed that other cabinet secretaries — including Treasury’s Steve Mnuchin, Secretary of the Interior Ryan Zinke and Environmental Protection Agency chief Scott Pruitt — have also contracted private or military jets while in office. Their fate now appears to be unclear. Price is the most senior ranking official to be forced out of the administration, although he’s far from the first.